With cloud becoming the bedrock of digital businesses, “cloud native” promises to be the default operating model for future enterprises and is garnering significant enterprise interest. However, the cloud-native concept has somewhat been misunderstood and under-positioned with respect to the complexities involved in practicing it and the immense business value that can be realized thereof. Cloud native is a complex theme and its adoption requires careful evaluation on the part of the enterprises as well as significant investments in terms of people, processes, and technologies. 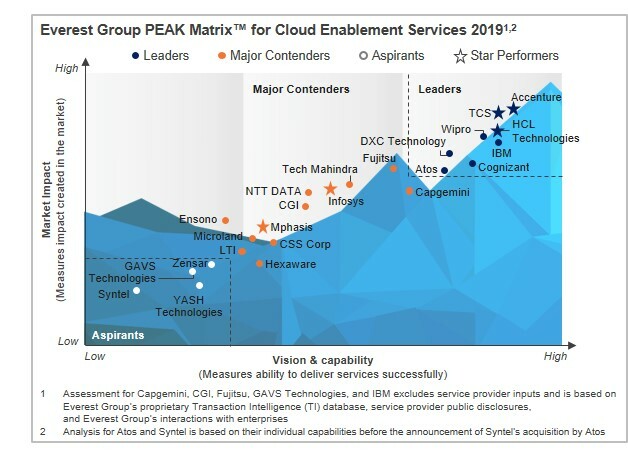 In this research, we present the assessment and detailed profiles of 24 IT service providers featured on the PEAK Matrix for cloud enablement services. Each service provider profile gives a comprehensive picture of the provider’s cloud enablement services vision and strategy, scope of services offered, innovation & investments, and delivery capabilities. This research also provides fact-based trends impacting the cloud enablement services market and an assessment of the below mentioned IT service providers / system integrators that are associated with cloud enablement services. The report covers the following IT service providers: Accenture, Atos, Capgemini, CGI, Cognizant, CSS Corp, DXC Technology, Ensono, Fujitsu, GAVS Technologies, HCL Technologies, IBM, Infosys, LTI, Microland, Mphasis, NTT DATA, Syntel, TCS, Tech Mahindra, Virtusa, Wipro, YASH Technologies, and Zensar.